By using the measurement framework, we can bring focus and clarity to what we measure and how we measure it. This truly shows the value or impact that our programs and services have on our end users and communicate that accordingly. In the June issue of Computers in Libraries magazine, the authors discussed how libraries should use a logic model in conveying their value to stakeholders. 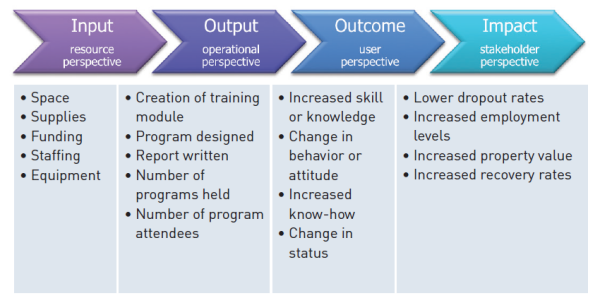 The model requires librarians to think as their stakeholders think and to develop measures of success in the form of outcomes and impacts that are unique to any given library’s situation. In this follow-up article, the authors give you a framework for charting your library’s course, as well as your own success. It’s a method that applies to everything from library evaluation to professional fulfillment. Here’s how to prove yourself by measuring the right stuff. What are meaningful measures? Well, that depends. Unfortunately, there is no silver bullet or universal measure. A meaningful measure depends on the context or environment within which you operate, your stakeholders’ strategies and objectives, and the outcomes and impact you want to achieve. How is this determined, and how does it translate to programs and services? You need to communicate how you have contributed to the goals and objectives of your stakeholders and why your existence and success is important to the objectives and success of your stakeholders. This is where the measurement framework can help. By using the measurement framework, we can bring focus and clarity to what we measure and how we measure it. This truly shows the value or impact that our programs and services have on our end users and communicate that accordingly. It may appear complex at first, but when it is broken down into its individual components, it’s much easier than you would think. It’s seven steps aimed at helping you determine what to focus on. 1 Understand the context. It’s exactly how it sounds. To be successful, you need to understand the context in which you are operating and the “contexters,” or stakeholders, that have a stake in your success (or failure). What’s important to your stakeholders, what do they value, and how do they measure this value? Keep in mind that this can change as your environment evolves. 2 Align strategies and objectives. Once you have a solid understanding of the context and the environment within which you operate, you need to align your own goals and objectives with those of your stakeholders. This is about ensuring that your success equals their success, or at the very least, that they understand what value you bring and how it impacts their goals and objectives. For example, in a public library setting, if one of the city council members’ strategies for their term in office is to ensure that newcomers are able to get jobs quickly (in order to begin contributing financially to the community), then you need to think about what you can do (or may already be doing) to assist in making this happen. Based on that, you will need to create your own goals and objectives and set targets to ensure that you are aligning yourself and contributing to the success of your stakeholders. 3 Identify services and programs. Think about what programs or services you need to offer, or put in place, to achieve your objectives. Consider which ones, if aligned with those of your stakeholders, will result in their success. Following the previously mentioned example, if the council’s objective is to have newcomers contributing to the community economically, while your objective is to link and provide access to language/literacy, employment, and social supports—what programs and services do you need to offer to ensure that this happens? Start using the logic model at this stage in order to plan your programs and services. Begin by determining what impact you want to have by offering said program/service. 4 Define measures. After determining what programs and services you want to offer, you will need to define what resources will be required, what success will look like, as well as how progress will be tracked and what indicators and what measures that you will use to provide you with the required proof and data to support your success. Using the logic model will be helpful during this stage. Measures will include operational, satisfaction, and value/impact. Operational measure will be quantitative and mostly for internal use. Satisfaction measure can be either quantitative (8 out of 10 on satisfaction with the program) and qualitative (comments about the satisfaction with the program). Value/impact measure will require follow-up with participants to determine the difference (the positive impact) the program or service made in their lives. 5 Manage the data. You’ll need to put resources and processes in place in order to capture and manage the required data. Someone needs to be assigned the responsibility of collecting, tracking, and interpreting the data. 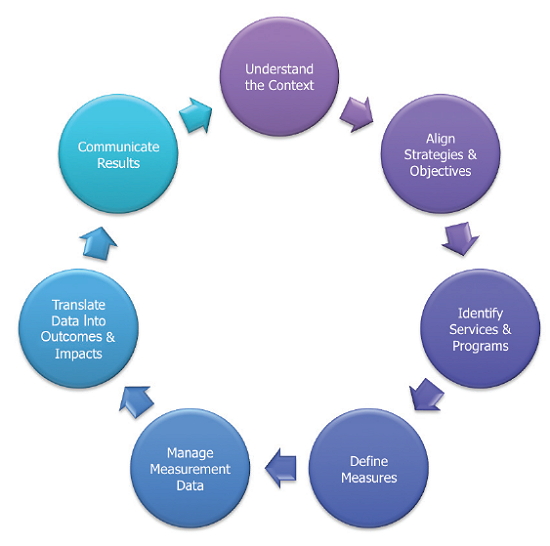 6 Translate data into outcomes and impact. If you are using the logic model all along, this is the starting point for determining whether to offer the program or service. This should also be linked not only to your own strategies and objectives, but also to those of your stakeholders. This speaks to the difference, or the positive impact, that your program/service had on the target audience. 7 Communicate the impact. You must understand the context and your stakeholders in order to do this well. You need to communicate how you have contributed to the goals and objectives of your stakeholders and why your existence and success is important to the objectives and success of your stakeholders. What value do you add? If our presence does not add value to their lives, then our absence will make no difference. Moe Hosseini-Ara (mhosse@markham.library.on.ca) is the director of service excellence, Markham Public Library (MPL), where he has led the organization through numerous innovative and transformational changes. Moe is a regular presenter at library conferences, speaking on use of library metrics, RFID technology, improving the customer experience and MPL’s winning customer centered classification system. Rebecca Jones, M.L.S. (rebecca@dysartjones.com), is a partner at Dysart & Jones Associates, where she consults with libraries of all sizes in public, government, academic, and corporate sectors. She speaks regularly on portfolio management, measures, and organizational design and development.